An Ankle sprain is actually an injury to the ligaments of the ankle joint, which are elastic, band-like structures that hold the bones of the ankle joint together and prevent excess turning and twisting of the joint. In normal movement, the ligaments can stretch slightly and then retract back to their normal shape and size. A sprain results when the ligaments of the ankle have been stretched beyond their limits. In severe sprains, the ligaments may be partially or completely torn. The most common type is the inversion ankle sprain (85%), in which the ankle rolls over on the outside. In the sprained ankle the most common damage is done to the talo-fibula ligament (if the ankle sprain is worse, the calcaneo-fibula ligament can also be damaged) - sometimes the tendons also get damaged. The ligament is injured when the plantar flexed foot is suddenly forced into inversion, which may cause rupture, sprain of lateral ligament. The injury is common in sports activity. It is quite common when a person slips off or walk on uneven surfaces. The foot is forced into inversion and plantar flexion which results in external rotation of tibia. The site of injury is generally the centre and distal attachments of anterior and middle band of the ligament. When sudden inversion force occurs with the ankle in mid position of dorsi and plantar flexion, the injury involves the calcaneo-fibular ligament(CFL). Whereas when the excessive inversion-adduction movement is associated with forced plantar flexion, the injury commonly involves anterior talo-fibular ligament(ATFL). This can be identified by the site of pain and tenderness. Pain and tenderness over talus indicates injury to talo-fibular ligament while the same over calcaneus indicates the involvement of calcaneo-fibular ligament. This identification is necessary for prompt treatment. First degree ankle sprain- Some stretching or mild tearing of the ligament.- Little or no functional loss - the joint can still function and bear some weight (...but hurts!!! ).- Mild pain-Some swelling- Some joint stiffness- Return to activity/functional phase in 1-2 weeks with proper ankle sprain treatment. Second degree ankle sprain:- Some more severe tearing of the ligaments-Moderate instability of the joint- Moderate to severe pain - weight-bearing is very painful- Swelling and stiffness- Return to activity/functional phase in 2-3 weeks with proper treatment. Third degree ankle sprain:- Total rupture of a ligament - there is a loss of motion-Gross instability of the joint - joint function is lost-Severe pain initially followed by no pain- Severe swelling- Usually extensive bruising- Return to activity/functional phase in 3-6 weeks with proper ankle sprain treatment. History- The patient describes 'going over' at the ankle. Pain- There is sharp pain just below and anterior to the lateral malleolus. Passive stretching and weight bearing increase the pain. Pain because the nerves are more sensitive: The joint hurts and may throb. Swelling- When an ankle is injured with a sprain, tissue injury and the resulting inflammation occur. Blood vessels become "leaky" and allow fluid to ooze into the soft tissue surrounding the joint. White blood cells responsible for inflammation migrate to the area, and blood flow increases as well. This is present from the lateral border of tendo-achilles, over the lateral malleolus along the dorsum of the foot. In severe injuries, swelling may spread to the dorsum of the toe and up to the leg. Bruising- This appears under the lateral malleolus and over the dorsum of the foot. Loss of function- All weight bearing is painful, so the patient cannot run and has a gait with a very short stance phase on the affected foot. 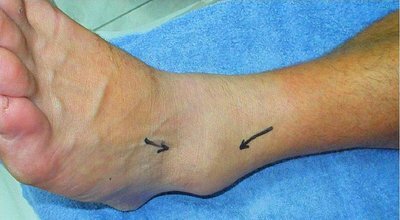 Physical examination reveals mild swelling in grade 1 sprains and moderate to severe swelling in a diffuse pattern in grade 2 and 3 sprains. Tenderness is usually elicited at the anterior edge of the fibula with ATFL injuries and at the tip of the fibula with CFL injuries. The region of the syndesmosis and the base of the fifth metatarsal should also be palpated to rule out injuries to these structures.Once proper physical examination and diagnosis is done Ankle sprain Treatment can be started. The Anterior drawer test and the Talar tilt test are commonly used to identify signs of joint instability. The Anterior drawer test is performed by stabilizing the distal tibia anteriorly with one hand and pulling the slightly plantar flexed foot forward with the other hand from behind the heel. A positive finding of more than 5 mm of anterior translation indicates a tear of the ATFL. The Talar tilt test is performed by stabilizing the distal tibia with one hand and inverting the talus and calcaneus as a unit with the other hand. A positive finding of more than 5 mm with a soft endpoint indicates a combined injury to the ATFL and CFL. It is important to always compare the affected ankle with the contra lateral side because some patients are naturally very flexible (generalized ligament laxity), and this could result in false positive test. Differentiating between a sprained ankle and an ankle fracture can be difficult, and sometimes an x-ray is needed. -Palpation of the proximal fibula close to the knee to rule out a Maisonneuve fracture (tearing of the interosseous membrane and proximal fibula fracture). -Squeeze test to rule out ankle syndesmosis tearing with resultant ankle mortise instability. -Palpation of proximal (base) fifth metatarsal to rule out avulsion fracture from peroneus brevis pull. -Anterior drawer and inversion (talar tilt) stress testing. -External rotation (Cotton) test to test for syndesmosis injury. -Motor testing of posterior tibial (inversion) and peroneal (eversion) tendons. Decrease pain and swelling, protect from re injury and maintain appropriate weight bearing status. 2) Rest (crutch to promote ambulation). 3) Ice Cryocuff ice machine, ice bags, ice with other modalities (interferential , ultrasound, high-voltage galvanic stimulation). 4) Compression Elastic wrap, TED hose, Vaso-pneumatic pump. 5)Elevation Above heart level with ankle pump. Decrease pain and swelling, increase pain free range of motion, begin strengthening, begin non-weight bearing proprioceptive training and provide protective support as needed. -Soft orthotics with 1/8-3/16 inch lateral wedge, if needed in Ankle Sprain Treatment. Progress weight bearing as symptoms permit. Partial weight bearing to full weight bearing if no signs of antalgic gait is present. -Active range of motion exercises- Dorsiflexion, inversion, foot circle, plantarflexion, eversion, alphabet. -Strength exercises- Isometrics in pain free range, toe curls with towel (place weight on towel to increase resistance). Pick up objects with toes (tissue, marble). -Proprioceptive training- Seated Biomechanical Ankle Platform System (BAPS). Wobble board. Ankle disc. -Stretching- Passive ROM- only dorsi flexion and plantar flexion in pain free range. No eversion or inversion yet. Achilles stretch. Joint mobilization (grade 1-2 for dorsiflexion and plantarflexion). Increase pain-free ROM. Progress strengthening. Progress proprioceptive training. Increase pain-free activities of daily living. Pain-free full weight bearing and uncompensated gait. -Stretching- of gastrocnemius and soleus with increased intensity. Joint mobilization (grades 1,2 and 3 for dorsiflexion, plantarflexion, and eversion, hold inversion). -Strengthening- Weight bearing exercises. Heel raises. Toe raises. Stair steps. Quarter squats. Concentric/Eccentric and isotonics (theraband and weight cuff exercises) for inversion, eversion, plantar flexion, dorsi flexion, peroneal strengthening. -Proprioceptive training ( Progress from non-weight bearing to controlled weight bearing to full weight bearing). Standing BAPS board. Standing wobble board. Single leg balance activities (Stable to unstable surfaces, without to with distractions). Proprioceptive training has a major role in Ankle Sprain Treatment. 2) Continue modalities as needed, specifically after exercise to prevent re occurrence of pain and swelling. 3) Taping, Bracing and orthotics used as needed. To avoid re injury. Regain full strength. Normal biomechanics. Return to participation. Protection and strengthening of any mild residual joint instability. Continue progression of ROM and strengthening exercises. Sports specific strengthening and training. Unloaded jogging. Unloaded running. Alternate jog-walk-jog on smooth straight surfaces. Alternate sprint-jog-sprint on smooth straight surfaces. Figure of eight drills. Zig-zag cutting. Agility drills like back pedaling, side stepping, Carioca. Plyometrics specific to each sport. Progress weight bearing multi directional balance exercises and movement activities. Fong DT, Hong Y, Chan LK, Yung PS, Chan KM. A systematic review on ankle injury and ankle sprain in sports. Sports Med. 2007;37(1):73-94. Kemler E, van de Port I, Backx F, van Dijk CN. A systematic review on the treatment of acute ankle sprain: brace versus other functional treatment types. Sports Med. 2011 Mar 1;41(3):185-97. Chung-Wei Christine Lin, Claire E Hiller, and Rob A de Bie. Evidence-based treatment for ankle injuries: a clinical perspective. J Man Manip Ther. Mar 2010; 18(1): 22–28.